Whether it’s been a few years since you’ve sailed, or you like the idea of having a variety of boats available to you (and sharing the maintenance of boats with others), the Viking Sailing Club is a great option. 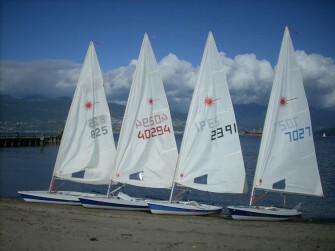 New sailor or experienced, the Vikings will get you sailing on beautiful English Bay! Sailing the Viking’s beach fleet is free to all club members. The boats you may sail depend on your ratings (see below) which are designed to develop your skills, ensure your safety and the safety of our boats. Novice – All new members begin as a Novice, no matter what previous sailing experience you have. Novices are checked off through our Training Curriculum Checklist by club Seniors. Intermediate – Intermediate rating qualifies you to sail our Tasars with other Intermediates, and learn to sail other fleet boats, in wind 10-knots or less. Senior – A Senior rating qualifies you to sail the Tasars, in wind up to the club maximum of 20 knots, with any skill level sailor from our club or with a guest. Seniors also train Novices and Intermediates as part of the co-operative spirit of the Vikings. The length of time it takes for a Novice to achieve Intermediate and Senior ratings depends on your previous sailing experience, time on the water, and participation in the club. Working to upgrade your rating is entirely up to you. Sailor ratings ensure that members sail our craft in a safe manner and with the skills and knowledge to keep them and our boats safe. We take safety and skill seriously. Tasar sailboats – Initial training is provided by club Seniors in our double-handed Tasar sailboats to achieve your Intermediate skill rating. Intermediates may then sign out and sail our Tasars with another Viking Intermediate or Senior. Intermediate Requirements: Pass our basic Training Curriculum. Senior Requirements: Pass our Training Curriculum in more than 15-knot winds under the supervision of 2 Seniors. Sailor Requirements: Tasar Intermediate Rating; Attend a Laser orientation session and/or be rated by a qualified Senior (in less than 10-knots). RS 500 – The 500 is a double-handed high performance dinghy with an assymetrical spinnaker and trapeze. Sailor Requirements: Tasar Intermediate Rating; Attend an RS 500 orientation session and/or be rated by a qualified Senior (in less than 10-knots). RS Quest – The Quest is a double-handed dinghy that carries up to 4 adults. It has an assymetrical spinnaker and is quite stable compared to its sister boat the RS 500. Sailor Requirements: Tasar Intermediate Rating; Attend an RS Quest orientation session and/or be rated by a qualified Senior (in less than 10-knots). 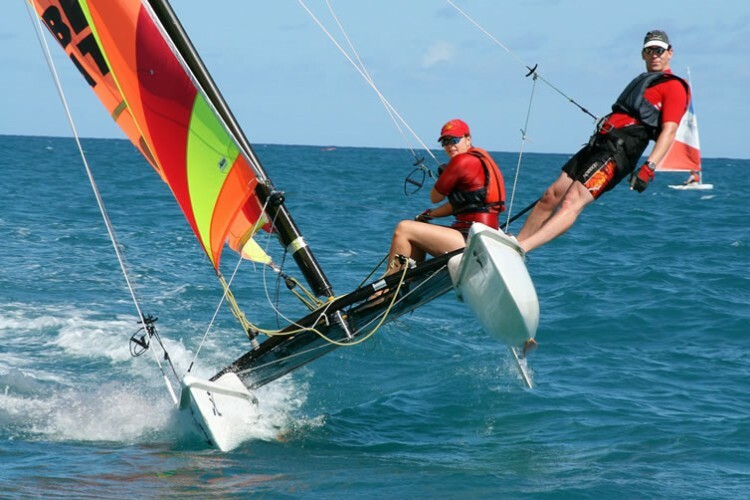 Nacra 570 Catamaran – This two-hulled boat is one of the fastest boats in our fleet. Intermediate Requirements: Tasar Intermediate Rating; attend a Catamaran orientation session or be rated by select qualified Seniors in less than 10-knot winds. Kayaks – Great for a leisurely paddle, a good workout, or when you arrive at the beach and the wind dies! Requirements: Tasar Intermediate Rating; attend a Kayak orientation session. Training for the kayaks is quite specific and to be rated you must demonstrate your skills to members designated by the vice commodore. Sailboards – An enjoyable alternative to our sailboats, particularly when winds are high. 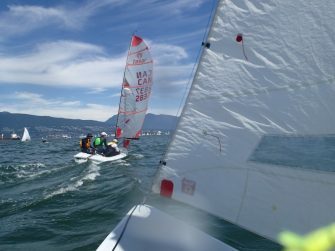 Intermediate Requirements: Tasar Intermediate Rating; attend a Sailboard orientation session or be rated by select qualified Seniors. Intermediate Sailboard rated sailors may use the beginner/intermediate boards. Senior Requirements: Attend a checkout clinic and be rated by select qualified Seniors. Senior Sailboard rated sailors may use the advanced high-wind board.